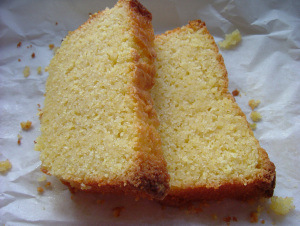 One of the first things that caught my eye in Bill Grangers’ new book was this recipe for Lemon Drizzle Loaf. I have a deep love for lemon desserts and cakes – fresh tart lemon mixed with sugar usually results in something wonderfully zingy and shebet-like. Add to this the bright sunny colour of this cake thanks to the addition of polenta and you have the perfect anti-dote to these dark, cold days. This is one of those cakes that is perfect on its’ own with a nice cuppa or served as dessert with a big dollop of cream. 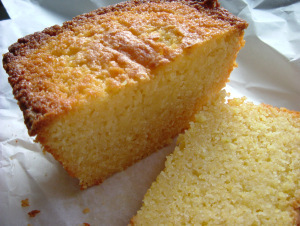 Bill adds blueberries to his Lemon Drizzle Loaf (200g if you wish to add) and I have tried the cake both with and without – my preference is to leave the fruit out as the ground almonds and lemon drizzle ensure the cake has a lovely moist texture within and the polenta adds a very slight crunch to the crust. Preheat the oven to 180ºC/gas 4 (my oven equivalent is 160ºC). Grease a 2lb loaf tin and dust generously with flour, shaking out any excess. Beat together the butter and sugar until light and creamy. Add in the eggs one at a time, mixing well as you add each egg. Fold in the flour, ground almonds, polenta, baking powder, lemon and lime juice and zest. If you are adding blueberries add them now and fold in gently. Spoon the mixture in to the tin and bake for 40 minutes, then cover with foil and bake for a further 20 minutes, or until a skewer comes out clean when you test the centre (I always use a piece of uncooked spaghetti to do this). Leave to cool slightly in the tin and then turn out carefully on to a wire rack. Mix the lemon juice and icing sugar together to make the drizzle. Prick the cake all over with the skewer the carefully pour the drizzle over the cake – you may wish to place a large plate under the wire rack at this point to catch any drips. Orange and Almond Syrup CakeIn "Cakes and Baking"
Apricot MuffinsIn "Cakes and Baking"
Oooh, love the look of this. Might just try making it during the week. Thanks for the tip about using uncooked spaghetti as a skewer, can never find a skewer when I want one. Hi there. It’s funny I got that tip from a Tamasin Day Lewis book but then watched Nigella’s Kitchen yesterday morning and she was making a Lemon Drizzle cake and used spaghetti too :) This is such an easy but seriously flavoursome cake – let me know if you do try. Me too! I love it… especially sugary lemon stuff – so sherbet like. I need to make a lemon meringue pie, my favourite.